MRT Race Tires (www.motoracetire.com) were a contributing winning factor for Renee Hudson “Getting Dirty for the Ta Tas”, as she earned 1st place in the Modified UTV Class, NORRA 1000 and took 48th place overall! NORRA (National Off Road Racing Association) 1000, is a 5 day, 1000 mile race from Ensenada to Cabo across a rough and rocky terrain. “Every day brought many challenges and some minor issues, but we made it across the finish line each day in the top 2”, according to Renee Hudson. On Day 3, Hudson, running about 80mph, hit something in the road and split the wheel in half… the MRT Race tire withstood the impact and remained intact. Hudson quickly recovered, but ahead she had to maneuver one of the biggest rock gardens on the planet. Almost at the end of the check point, her vehicle died – a jump from a chase truck was enough to get her across the check point to the pit for a quick repair, then across the finish line in Lareto. Day 4 Hudson smoked both of her rear axles about 60 miles from the finish in La Paz, but she was able to make it across the finish once again. Day 5 was the final leg to Cabo, and the finish line. The final 16 miles were a challenge with the dust conditions and Hudson turned to the rally book to navigate to the finish line. “It was the most amazing feeling in the world to have actually driven all 1,368 miles of NORRA and to win the Modified UTV Class. I am so blessed and thankful for all who have so much faith in me!” exclaimed Hudson. “My MRT Race Tires were subjected to a rough and rocky terrain and didn’t let me down! Thank you MRT!” Renee Hudson races for “Getting Dirty for the Ta Tas” an all female offroad racing team dedicated to driving awareness and finding a cure for breast cancer. 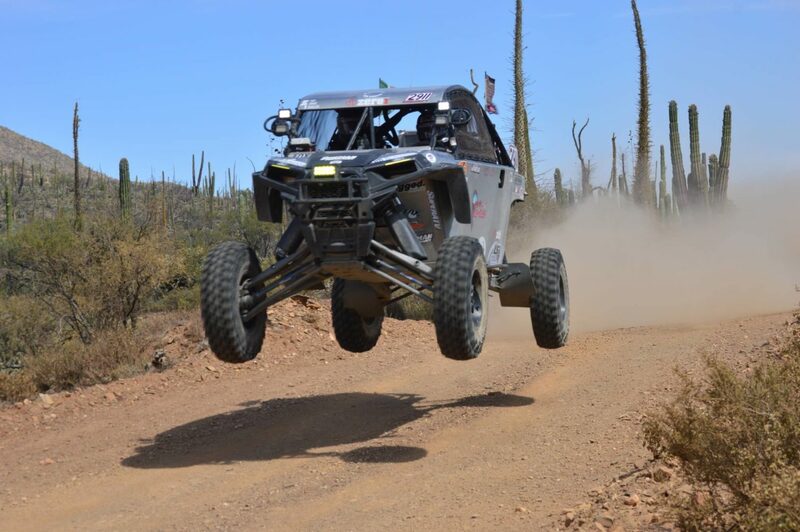 MRT tires were a contributing factor to this winning scenario with their Kevlar Armor Belt tires that have proved their anti-puncture quality by standing up to extreme racing terrain and weather conditions. This quality allows the drivers the confidence to tackle tough terrains and weather conditions. “We are so proud of Renee Hudson’s win in NORRA 1000! Our motto ‘Quality When You Need It’ is proven again and again on courses like NORRA 1000. We achieve excellence by testing, failure analysis and continuous innovation. MRT tires pass the strictest of tests and scrutiny before they are released. It’s this focus that allows drivers to race with confidence. We also accredit the Kevlar Armor Belt as the strongest best traction UTV tires on the market. And our continued innovation ensures our tires are always able to succeed through the toughest challenges” according to Mark Thornburg, president MRT. Day 5: WIN for Renee Hudson!